Led by General Manager Kevin Gordon who rocked the piano to a myriad of yuletide carols and marketing and public relations staff as back up singers, Digicel gifted students at the Elsyn Henley Richiez Learning Center on Monday afternoon. Exchanging high fives with students before helping to pass out gifts, Gordon caught everyone by surprise when he jumped on the piano and brought a festive mood to the students and staff present. He even shared a moment with Tashara Islas on the piano, much to the delight of her fellow students and staff. 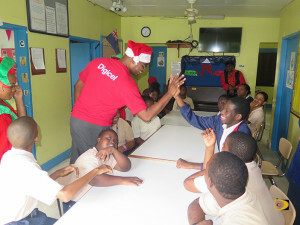 Then it was time to distribute gifts to all the students as Digicel gifted everyone and brought smiles to their faces. “Santa is here early,” a jovial Gordon told the students and staff who showed their appreciation. 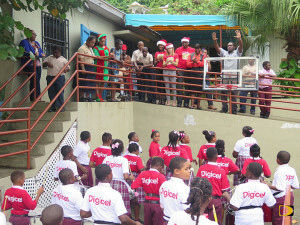 Following the gift giving and yuletide pleasantries, Althea Scattliffe Primary School which has been adopted by Digicel, their famed Drum Core revved up the the tempo in the school’s courtyard, for the staff and Digicel staff.